The other day I wrote about how we've seen a 2% drop in the labor force participation rate. One group that dropped significantly was teenagers age 16-19 years old. 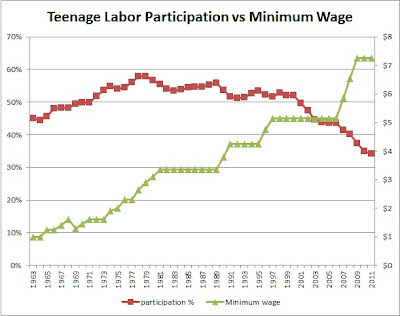 PK commented in reply to that article and suggested I take a look at the teenager labor force participation rate as it relates to the minimum wage rate. I found the history of minimum wage rates at The Digerati Life. 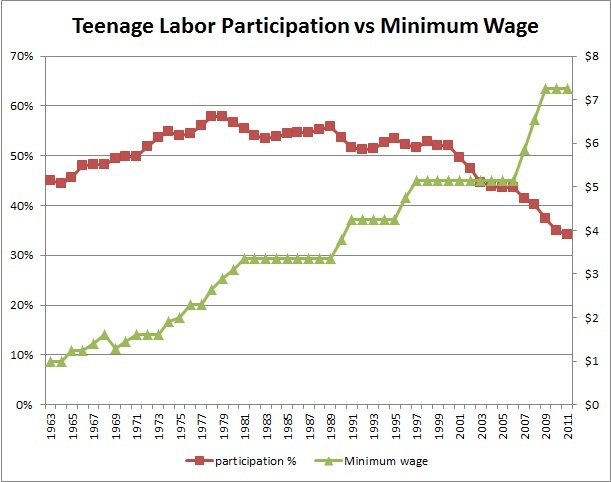 Looking at that chart I don't see any kind of consistent correlation between the labor force participation rate of teenagers versus the minimum wage. During the 60's and 70's both the labor force participation rate and the minimum wage were on steady upward slopes. Then in the 80's and 90's the labor force mostly flattened out with some bumps up and down. Yet the minimum wage was flat most of the 80's and 90's but there were a couple increases. In the 21st century the labor force rate has been declining steadily while the minimum wage has been flat then up then flat again. Part of the time they are going in different directions and other times they go in the same direction. Its not at all consistent. I don't see any real relationship between the two values. We just went through a major recession so I wondered if the teenage labor force participation rate was impacted by recessions in general. The average change in labor force participation during years we had recessions was -0.7%. For other years the average change was 0.0%. 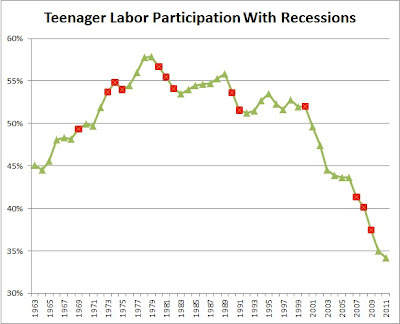 Lets plot the recession years on the graph of teenager labor force participation. This looks more like a trend to me. 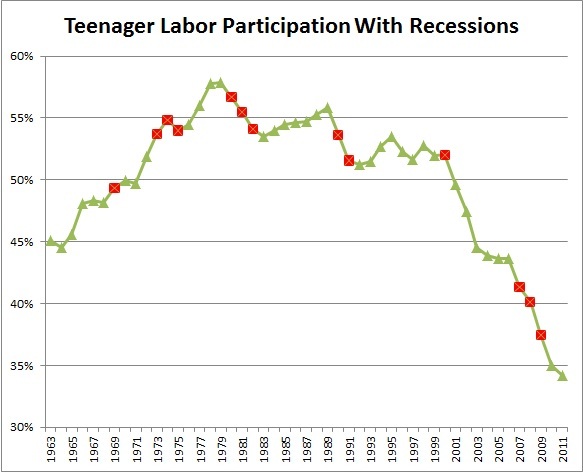 During the 60's and 70's the labor participation for teenagers was going up steadily but flattened during the recessions. Then in the 80's and 90's the participation rate dropped along with the recessions but was inching up otherwise. In the 2000's the rate has been dropping and it dropped the fastest during the most recent recession. Bottom Line : I don't see any real correlation between teenager labor force participation rates and changes in the minimum wage rates. I do think there is some direct impact on teenager labor force rates and slowed economy during recessions.